Do you get an overwhelming surge of anxiety when you see the words, “can we hop on a Skype call?” land in your inbox? Perhaps you stop in your tracks, or even go so far as to plan a call and cancel at the last minute. I spent the first six months as a freelance writer avoiding video chats like they were an infectious disease. My lack of confidence and anxiety that I’d screw-up were always at the forefront of my mind, which is why I insisted in only being contacted via email. It wasn’t until a few months ago that I really felt like I needed to video chat with my freelance writing clients. A high percentage of inquiries asked me to hop on a video conference and chat about how we could work together, and it felt like I was missing out on major opportunities that had the potential to be a major money-earner for my business. Even though that thought process circled in my head for months, it wasn’t until then that I felt serious about cracking my video chat anxiety. And trust me, it wasn’t easy. Instead of looking at a client call like a job interview, think of it as two business owners sussing out whether their services and needs align. Not only will this take pressure off yourself, but it gives a more professional vibe to your potential client. Video chatting with clients gives you the chance to get to know them in more detail. Instead of sending out a tedious client questionnaire for new inquiries to fill-in, hopping on a Skype call can let you squeeze more detail about the brand, project and requirements. Understanding each three of their elements puts you in a better position to create awesome content for them. After all, the more detail that you get from them, the more accurate your content will be! You know that helpless feeling you get when you want an instant response from a client? Whether you’re looking for the go-ahead or details on their new project, you can feel in-limbo when waiting for a response via email. However, unlike email where you have to wait, Google Hangouts and Skype calls mean you’ll get an answer on the spot. No more waiting and chasing emails – ask them directly and get the answer you need. While you may already understand benefits of video chatting with prospective freelance clients, there’s likely to be one thing that’s putting you off the webcam: anxiety. Anxiety is a completely normal emotion to feel when you come to hopping on your first call. You might not have a clue about the person on the other end, where the conversation will lead or how to can sell your services in the right way. Practicing with non-clients beforehand is a fantastic way to get over your call anxiety. Ask your online friends to have a Skype coffee chat, or sit in another room and video chat your partner to get used to the software. Ever heard the phrase, “by failing to prepare, you’re preparing to fail”? While you’re likely to ace your first call without any practice, it can ease your anxiety if you know that you’ve done your homework. Their current content strategy, and where they could improve. It’s also useful to have a list of questions that you’d like to ask your client at the end of your call. This can include pricing details, clarification on their target audience or the schedule of work. There’s nothing worse than trying to start a sentence, only for your mouth to dry-up and struggle to get your words out. It happens to the best of us and might be one of the main causes of your Skype call anxiety. Always keep a glass of water nearby. Not only will it help you to feel refreshed on your call, but it’ll give you peace of mind to know that there’s always a backup for a dry mouth! If you’re anything like me, the feeling of hearing your voice on tape and thinking “Do I really sound like that?” is gut-wrenching. But, it’s a fantastic way to spot any bad habits that could give the wrong impression to your clients. Use a screen recording software, or a voice recorder on your mobile phone, to record your practice run. Do you speak too quickly that it is sometimes too difficult to understand what you’re saying? Can you explain your service in a clearer, more direct way? Do you cut-off your client mid-sentence because you’re too excited about the thought of working with them? Recognizing these habits will help to improve your communication when you’re on a freelance call. It’ll help you secure the main aim of them: landing them as a client. Have you video chatted with prospective clients? How do you prepare for your calls? How Do I Deal With Isolation When I Work From Home? I’ve never done a video call with clients before but I have had them want to jump on a call with me before. I used to use Acuity Scheduling to keep everything in order on my side since if I didn’t have reminders set up, I’d forget about it. 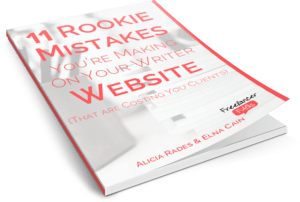 (I’ve done it with webinars before and learned that lesson the hard way!) Anyway, I’d welcome the idea of a video call with potential clients. I would love to be able to see their face instead of just corresponding via email. I would definitely be nervous beforehand, however, since I do have an anxiety disorder. I’m on anti-anxiety medication for it so I suppose that would be my answer to doing away with the pre-call jitters. Thank you for suggesting the idea of video calls with clients, Elise!